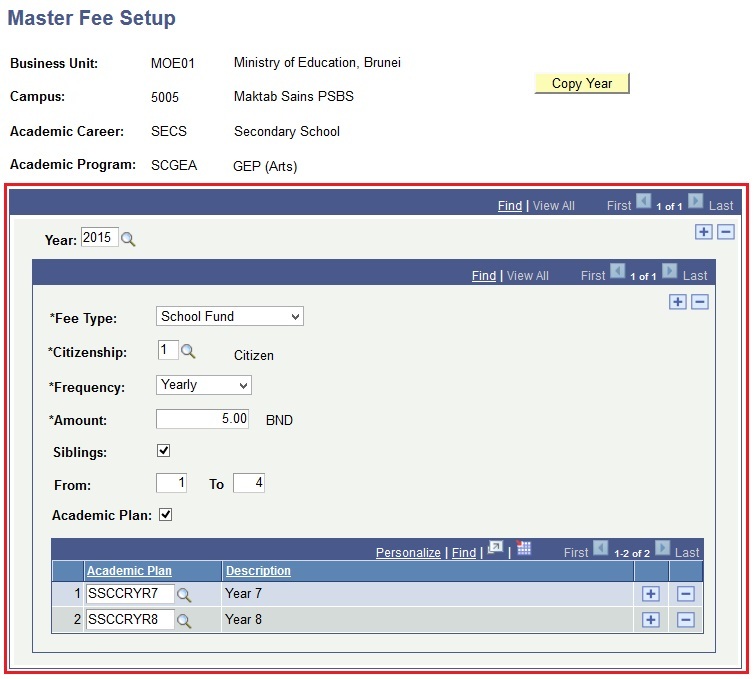 This function allows the users to setup and store various fee types that are charged by the schools as well as the amount and criteria for charging those fees. Note: Only School Fees and School Fund Fee is charged automatically. This function will be use to create the setup for all the fees which depends on the school. 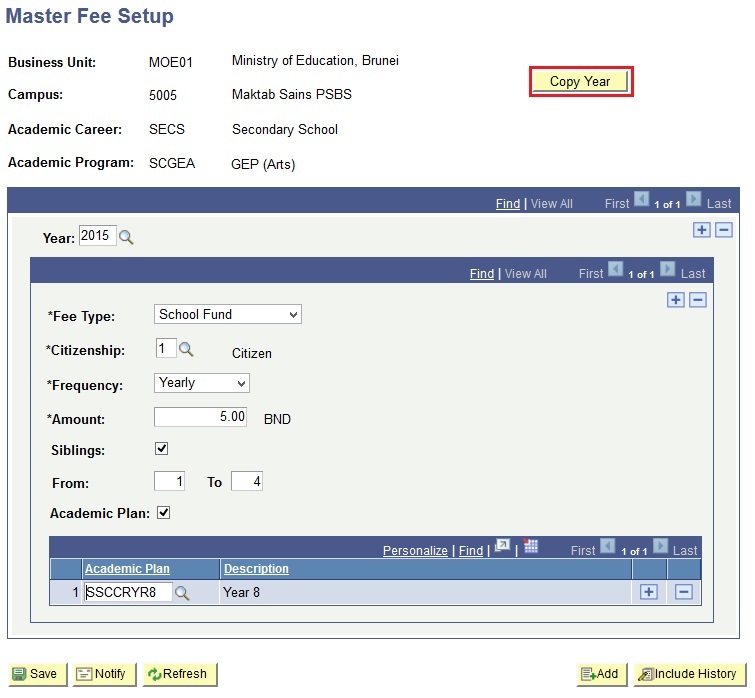 Navigate to Main Menu > Setup SACR > Product Related > Student Financials > Tuition and Fees > Master Fee Setup. Enter the values in the Business Unit, Campus, Academic Career and Academic Program fields.tab. 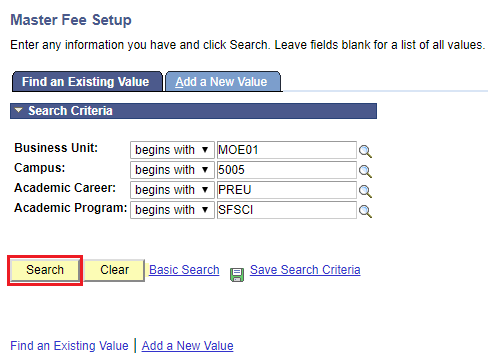 Note: The Academic Program field can be left blank if fees for all programs is the same. Academic Career: "PRIM", "SECS", "PREU"
Note: Make sure the required fields are not empty: Business Unit, Campus and Academic Career. You will be directed to the Master Fee Setup page. 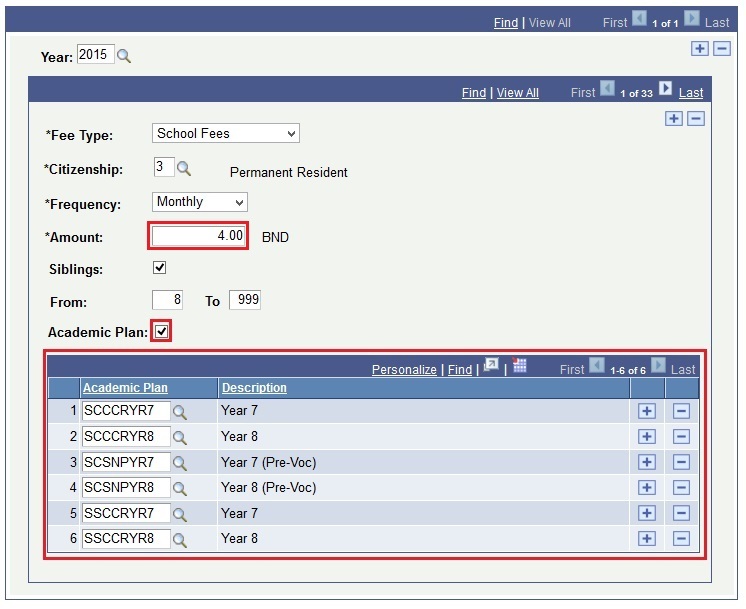 Enter the values in the Year, Fee Type, Citizenships, Frequency, Amount, From, To and Academic Plan fields. 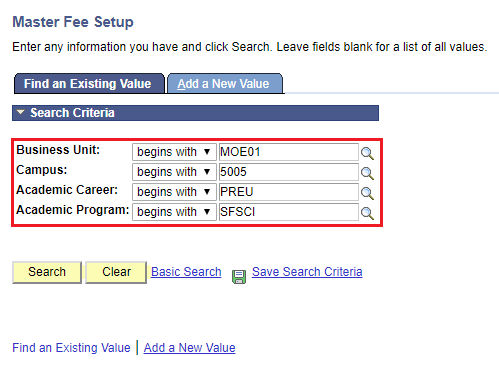 Also, tick the checkbox for Siblings and Academic Plan checkboxes. 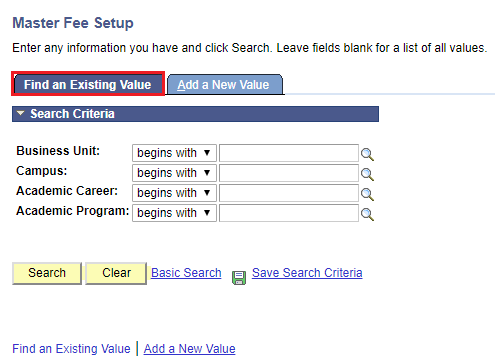 Note: Click the '+' button if want to add a new value for the Year, Different Fee Types and Academic Plans. Note: Make sure the required fields are not empty: Year, Fee Type, Citizenship, Frequency and Amount . 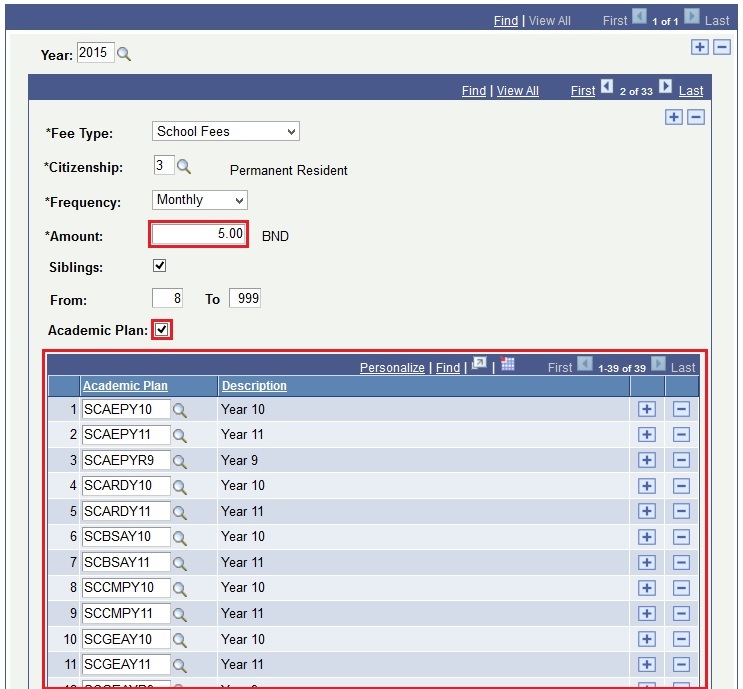 Year: Field to capture the year from which the fee setup is effective from. There no need to add a new value for this field every year. A new row here should only be added when there is a change in the school's fee policy. 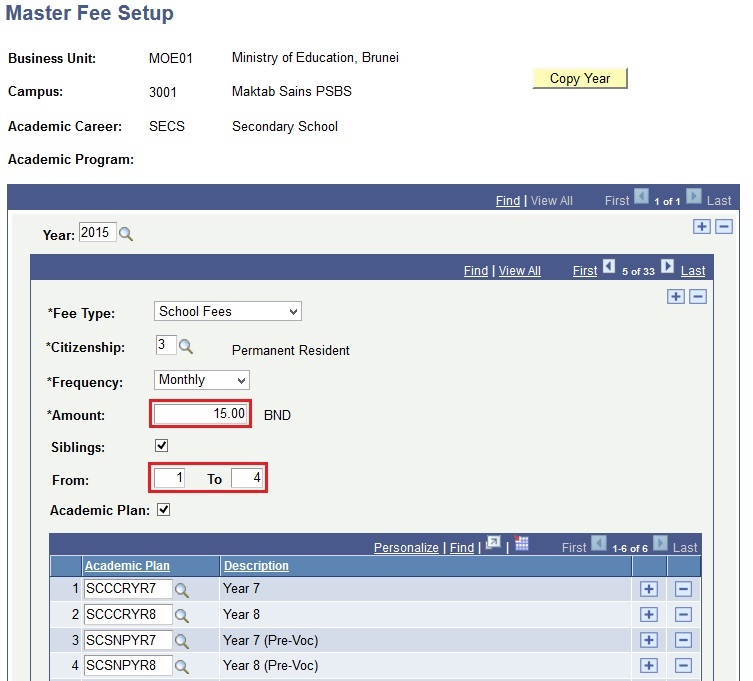 Fee Type: Field to capture the different fee types charges in a school. A new row needs to be added for each Fee Type that the school charges. Note: The following fields define the criteria for charging each fee type. Frequency: Field to capture how often is the fees charged: Monthly, Yearly, Once. 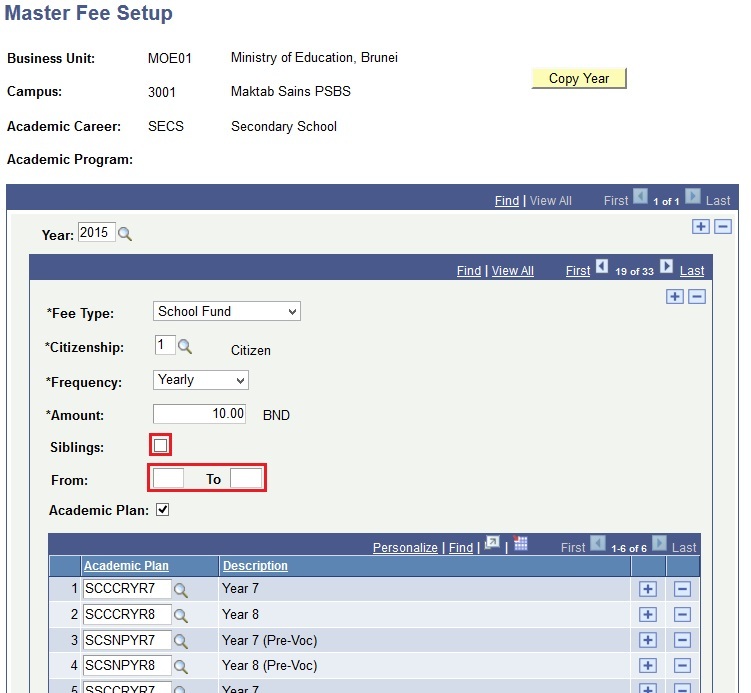 Amount: Amount charges for the Fee Type. 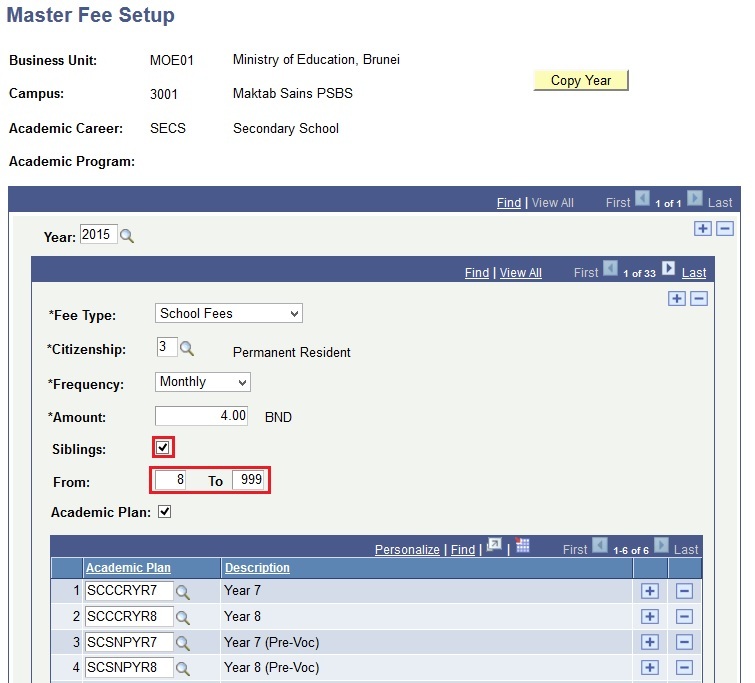 Siblings: Check this checkbox if the Fees charged depends on the number of siblings the student has. Siblings checkbox must be ticked if the user want to add the number of Siblings in the From and To fields. Uncheck Siblings checkbox if users don't want to add Siblings in the From and To fields. From and To: These fields are only required when Siblings checkbox is checked. 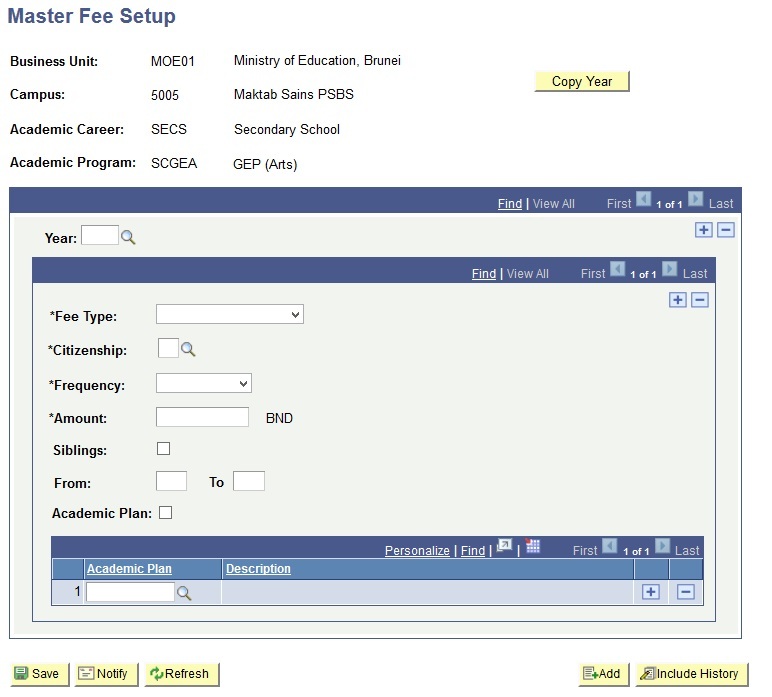 The number of Siblings determines the Fee cost for the students. E.g. From 1 to 4 cost about $15 for School Fees (PR). Other example is when Siblings From 5 to 7 cost about $7, which gets a discount if they have many siblings. 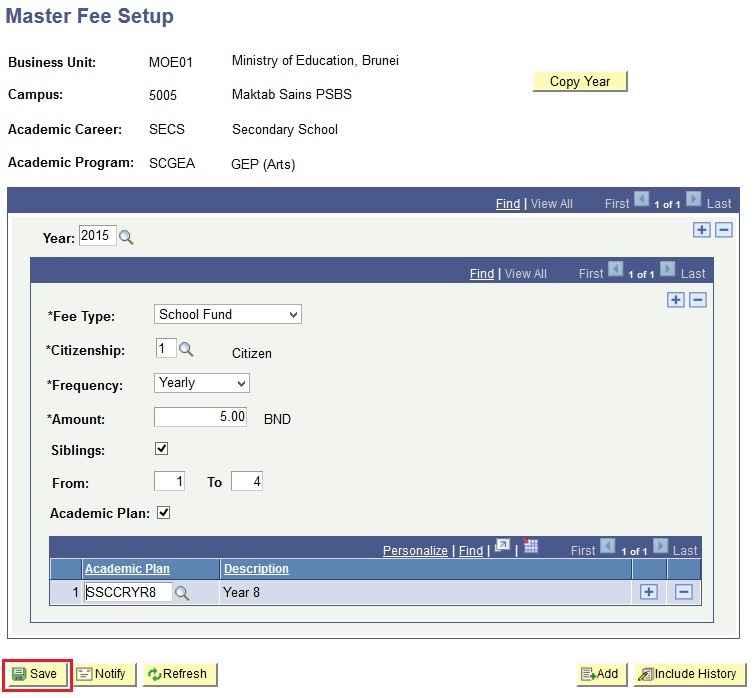 Academic Plan: Check this checkbox if the fees charged depends on the Level in which the student is in. e.g. When students is Upper Secondary pay a different fee then students in Lower Secondary. Example, Academic Plan for Lower Secondary which are Year 7 to Year 8. Other example is Academic Plan for Upper Secondary which are Year 9 to Year 11. 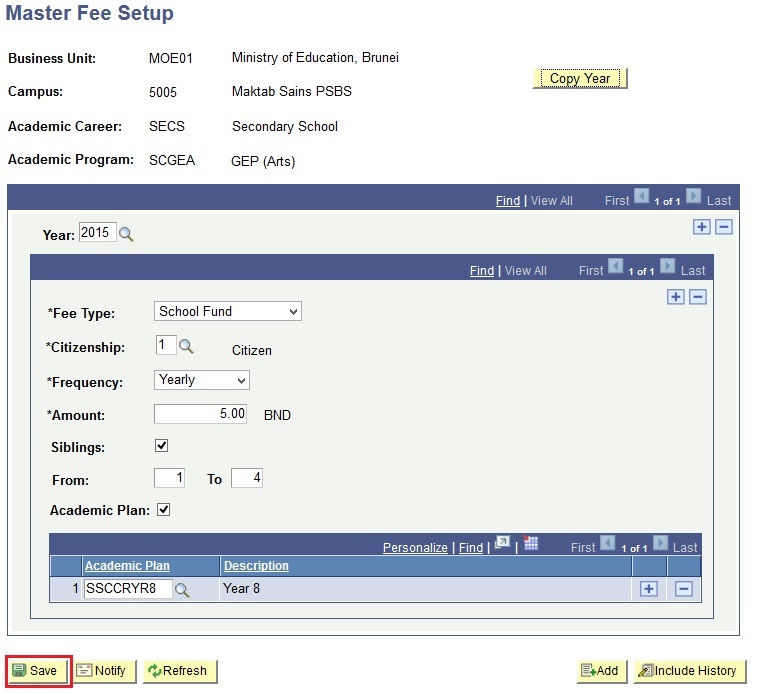 If there is a policy change and the school wants to either change the fee amount or add new fees starting from the new school year, a new row needs to be added for the Year field. This function copies over the fees from past year to a new year. 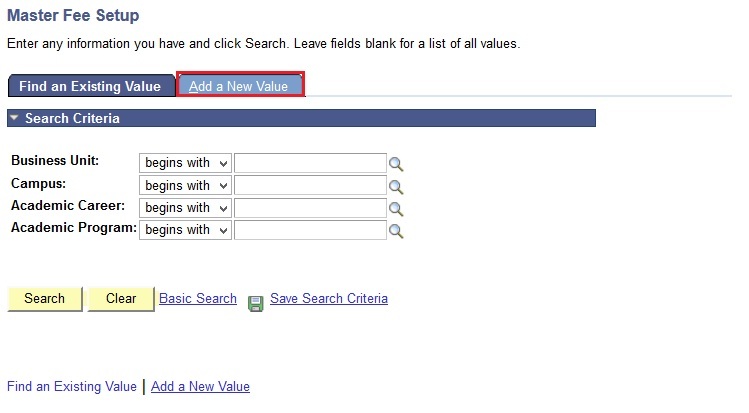 Teachers can then change the value of the fields required. Enter the values in the Business Unit, Campus, Academic Career and Academic Program fieldstab. 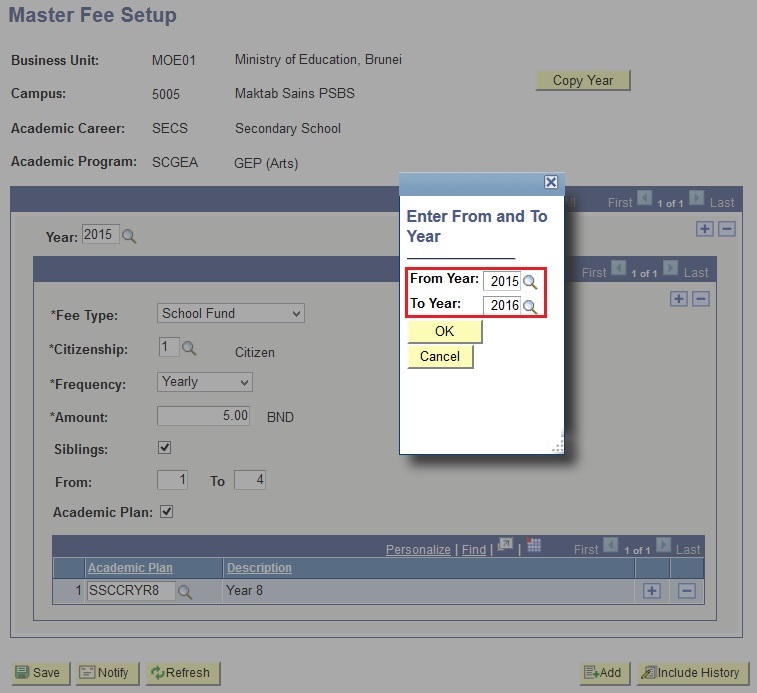 Click the Copy Year button if want to make another setup for the fees in a different year. Enter values in the From Year and To Year fields. Next click the Ok button and you will be directed to the Master Fee Setup page again. Note: All the values will be carried over to the year that is entered into the To Year field. Change fee values as required.